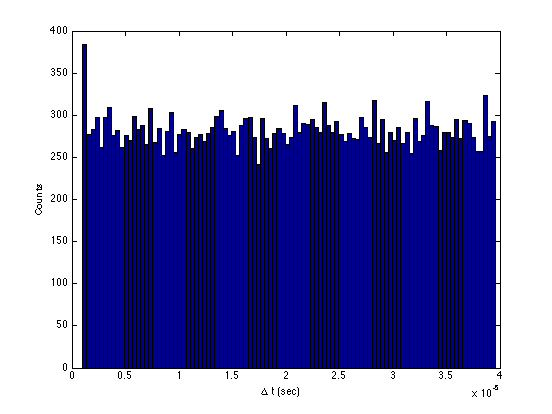 This section will introduce you to the Matlab numerical computing environment. If you have some experience with other computer languages, you can probably get by with just a quick skim of this section. You can pick up most of what you need just by following the examples. If you have little or no experience, type along as you read. This section is written to accompany the Error Analysis Exercise (EAX) and other Physics 111 Advanced Lab experiments that need data analysis completed. If you would like a more formal introduction to Matlab, try visiting this link at the Mathwork's website and click on 'Introduction'. The first few sections are particularly helpful. Don't worry if you have a little trouble with some of the concepts in the section. Things will become clearer as you do the examples in the following sections. The name 'Matlab' is short for 'Matrix Laboratory'. 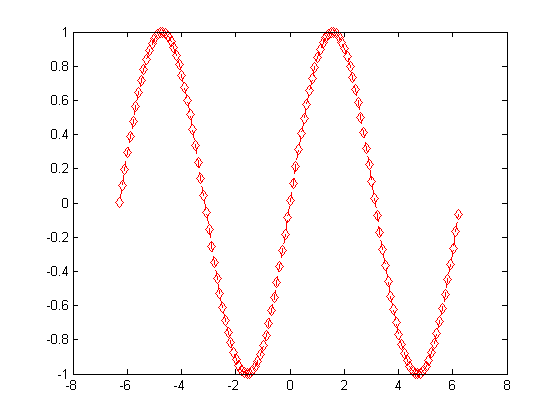 Matlab is programmed in a language called m-code. M-code was originally created in the 1970s as a simple alternative to Fortran. Since that time, The Mathworks (the company that develops Matlab) has added many new features to the language. Matlab contains sophisticated functions for manipulating matrix data. A student license to Matlab is available for about $100. Physics 111 has Matlab with Statistics Toolbox package installed on all lab computers; see lab staff for remote access. 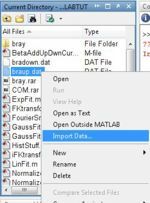 The first step is to copy any data or other files with Matlab scripts to your own My Documents directory. There is no remote access to Matlab. Use it from within the Physics 111-Lab or purchase your own student copy for home use. Before you start typing commands, change the current working directory to your own My Documents folder. 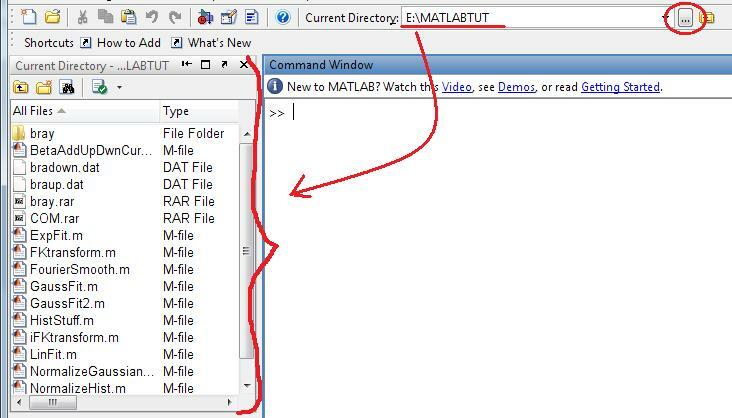 To do this, click on the little button with three dots near the top right of the Matlab window. Use the Windows directory browser that comes up to select the folder you want. Scroll to the top and select My Documents and then select a working folder Your experiment Name. Note that any scripts you wish yo use must be placed in this folder to ensure they work properly! It also provides quick access to your data for importing purposes (as we will discuss later). The Matlab window is divided into multiple panes. By default, on the top left is a listing of the current directory. Below that is a history of the commands you have typed. On the right is the command window. Click anywhere inside the command window to select it. Further to the right is the Workspace, where your variables are listed. Here we evaluate the sine of 1.2 radians, using the predefined function "sin". Note that if you wish for Matlab to evaluate an expression but NOT display the result on the screen simply put a semi-colon at the end of the line. This might not seem useful if you're not actually doing anything with that result since you can't see it, but when you save something into a variable (we shall discuss this promptly) or are performing a manipulation on a large amount of data, you might not want the screen to be suddenly filled with the result of your expression. Type help and the name of the command to get full documentation. If you are really in trouble, try help help. SIN    Sine of argument in radians. However, note that the previous value of ans has been overwritten with the new one since we again did not supply a variable to store it into. Remember to store important data values in variables! Also note that all your variables are displayed in the Workspace pane of the Matlab screen. These variables can be easily copied/renamed here. 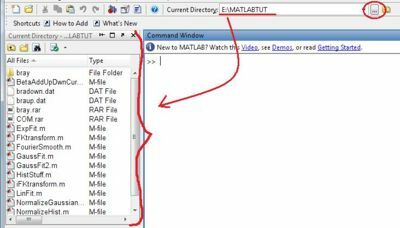 The Matlab Workspace contains all the variables in this session of Matlab. Use the colon (:) operator to generate a matrix of uniformly incrementing values. With two operands, each element increases by 1. With three operands, each element is incremented by the middle value. Multi-dimensional matrices are accessed using the same parenthesis operators, but with the index of each dimension followed by commas. As an example, in a 2-dimensional matrix, variable(row,column) accesses the row-th, column-th element of variable. You can also simply use a : without any numbers to denote "all" of a column or row. Note the final example. Here we use the . * operator to multiply each element of A by each element of B. 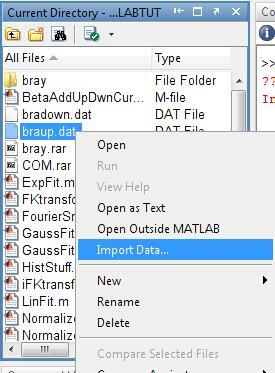 The newer versions of Matlab with their nice graphical user interface have made it very easy to import data. If you have your data in your working directory you can just right-click the file in the directory browser pane and click Import Data to start the Import Data wizard. If your data is stored outside of the working directory, clicking File-> Import Data will bring up a Windows file browser window where you can select your data file. At the left side of the Import Wizard is a display of your data file you are importing. Make sure that the number of header lines in your text file is correctly input in the box at the top-right of the wizard! An incorrect number of header-lines could result in loss of data or incorrect formatting. 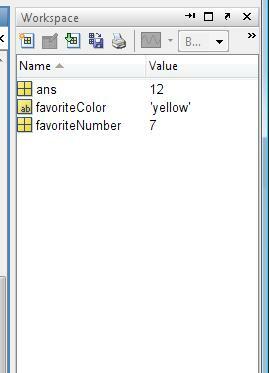 Also ensure that Matlab knows how columns are separated in your data file (i.e. different data values on the same line are separated by tabs, spaces, commas, etc.) A preview of what the variable will be is shown on the right side. On the next screen will be a display of the variables that will be imported. 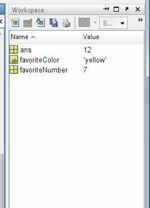 By default Matlab will select to "Create variables matching preview." which references the preview from the previous window. 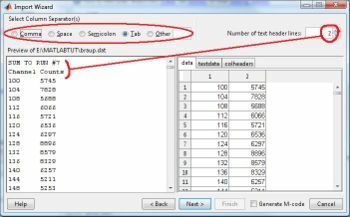 If you are using this setting (and most of the time it is useful to) the default variable-names shown are typically colheaders, data, and textdata. 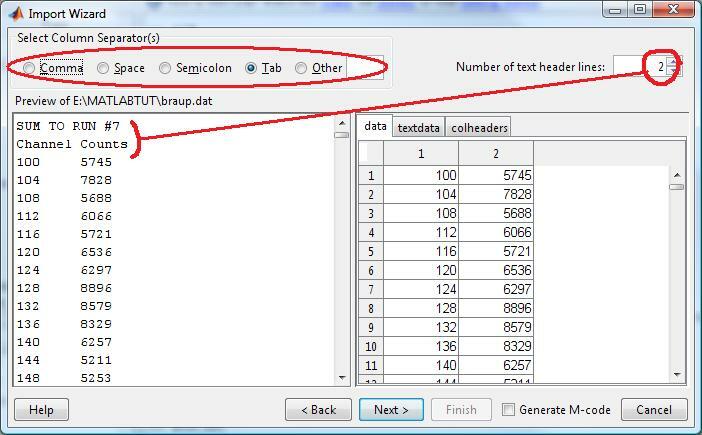 colheaders and textdata represent Matlab's attempt to use the text header lines to extract information about the data and can be typically ignored (Just make sure that you know for yourself which column in your data variable represents what!) 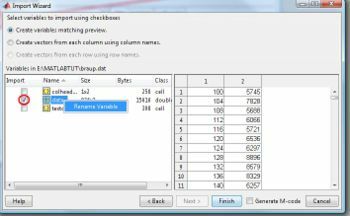 The data variable always defaults to the name data, so if you're importing multiple data-sets, ensure that you rename the variable to something that you will be able to differentiate between. Now that you have your data variable, you can use it as a matrix as described in the preceding sections. As a tip, it might be easier for you to reference the data if you separate it out of the 2-dimensional array. In our example, the data we were importing was a histogram, where the first column was the channel and the second was the corresponding number of counts. This gives us two separate 1-dimensional matrices, which are more commonly used by the plot and fitting functions described later. Note that we used a colon instead of a row number to denote that we wanted all rows (i.e. the entire column). Also note that we used a semi-colon at the end of the expressions to suppress output in order to ensure that the Command Window was not suddenly filled up with 976 rows of data. Of course we could always just use variable(:,1) for example to get the 1st column of a multi-dimensional matrix for plotting, but sometimes using separate variables can make it less confusing. Do note that by doing this we essentially doubled the space used by the variables in memory (since it is saved twice now, as a multi-dimensional matrix and as two separate 1-dimensional ones), so keep that in mind if your space is limited. Sometimes, it is useful to group related pieces of data together. Matlab supports data structures with the dot (.) operator. Note: Matlab likes to print a bunch of junk out after most commands. To suppress this sometimes annoying habit, put a semicolon after the command. This is particularly useful when you are working with large matrices. Begin comments in your code with a % character as below. Matlab supports another kind of matrix called a cellular matrix. 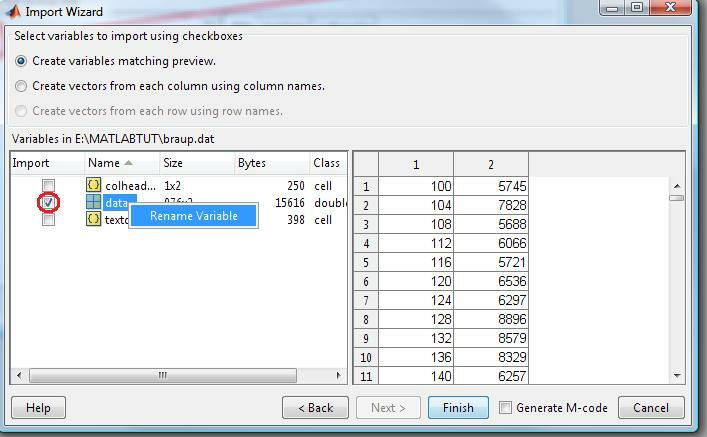 Instead of numerical values, each element in a cellular matrix can hold any Matlab type. Elements of cellular matrices are accessed with braces instead of parenthesis. The whos command prints a list of all the defined variables with details about their size and type. A for loop executes a sequence of commands multiple times. The loop begins with a for statement and ends with an end statement. The for statement specifies an index variable and an ordered set of values (contained in a matrix). The statements in the body of the loop are executed one time for each of the possible values, in order. For example, the body of the following loop executes 10 times and calculates the sum of the first 7 positive integers. 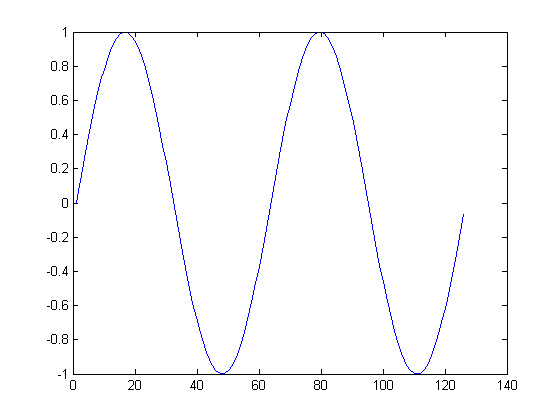 If x and y are vectors, plot(x,y) plots vector y versus vector x. Notice the difference in the x axis. The third (optional) argument to plot is a line specification. This particular string of characters will create a red (r) dashed(--) line with diamond shaped (d) markers at each data point. There are many more options available for the plot command. Type help plot for details. fopen returns the file handle f, which is used in subsequent I/O operations, e.g. reading. This fill read the entire file f, and convert the contents into a 5*inf matrix data of floating-point values. count contains the number of values read, i.e. 5 times the number of columns in the matrix data. A more powerful function to use is textscan (see help textscan) which would allow you to skip headers, etc. It returns a mix-typed cell structure, which can be converted to a matrix with function cell2mat. This will write 10 formatted lines of data. It would be appropriate to plot the data with error bars, to reflect statistical fluctuations. 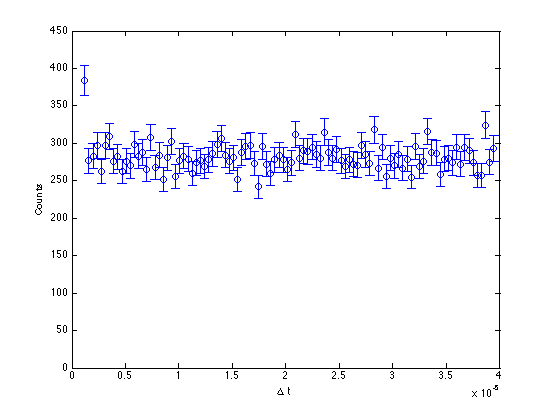 Unfortunately, unlike ROOT package (see Muon Analysis in ROOT), Matlab will not do this for you automatically. Fortunately, this means you have to think about what you are doing. The problem with polyfit is that it implements unweighted least-squared minimization. To do a weighted fit, e.g. to weight the points by their inverse variances, you can use lscov function, or (instructive) implement your own algorithm based on formulae in Taylor. Those who want an easy way out can download one of the functions freely available on the internet. 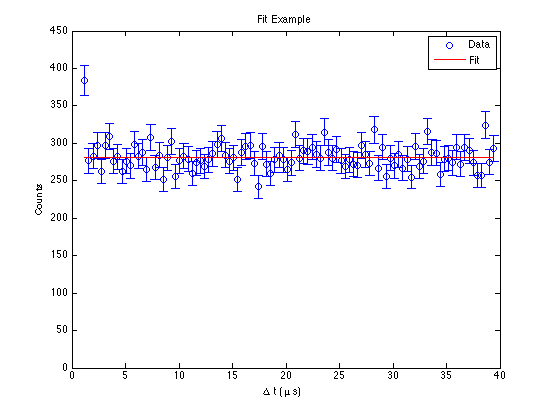 For instance, the algorithm for a weighted linear fit can be found here. Unbinned ML fits are generally more powerful than binned, least-squares fits, but you have to be careful with the outliers in the data. 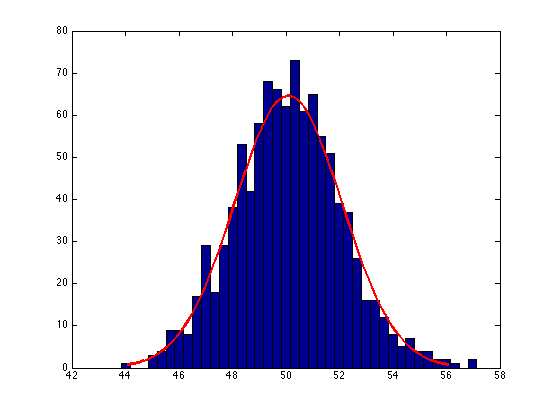 ML fits also do not provide an immediate goodness-of-fit measure, such as \( \chi^2/df \), so you have to compute it after the fact for a reasonably binned histogram. For a ML fit tool, type help mle.